Around 11am on Wednesday, a canopy over a restaurant's back door collapsed after heavy rain in Longgang District, Shenzhen. 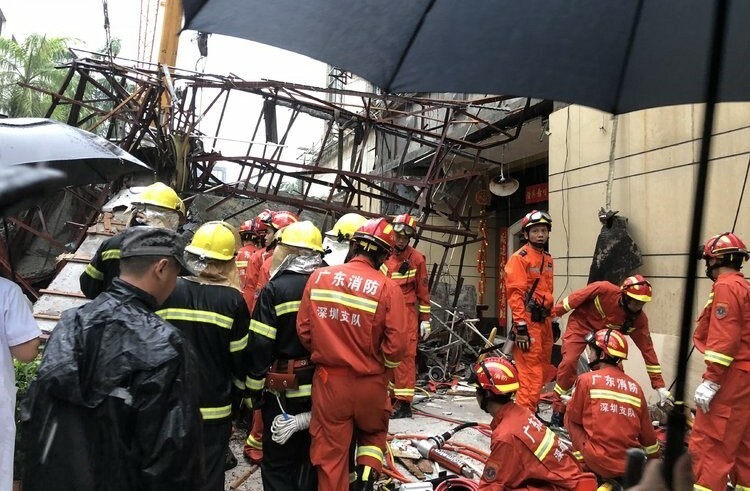 Of the six people caught under the fallen structure, four died and two are being treated for minor injuries, according to a Weibo post by Longgang's local government. According to SZNews.com, the scene of the accident was a seafood restaurant on Xinyuan Lu, in Pinghu. The local fire station got a report at 11.03am and sent rescuers to help. At 4pm that day, firefighters confirmed that all six people trapped under the canopy had been freed, although two had already perished. Two other died later that day. Sina News reported that heavy rain caused the reinforced concrete structure to collapse. According to nearby residents, people had been sheltering under the awning due to the weather that morning. When That's asked Pinghu police how a concrete canopy was broken down by rain, an officer declined to offer any further details, saying that the incident is still under investigation. The torrential rain was caused by tropical depression Ewiniar, which developed into a tropical storm yesterday morning. At 12.55pm Wednesday, Shenzhen's meteorological bureau released a red rainstorm alert, although it has since been downgraded to orange. A white typhoon alert is also active for Shenzhen, and is expected to be upgraded as the storm approaches the PRD.